Buenos Aires (Agenzia Fides) - The 116th Plenary Assembly of the Argentinian Episcopate (CEA) is taking place, from November 5th to 9th in Pilar. As usual, there will be space in the work program to inform and discuss the reality and pastoral care of each diocese, therefore every CEA Commission will have the opportunity to express their views and finally some important issues that involves the Church in this country will be addressed. 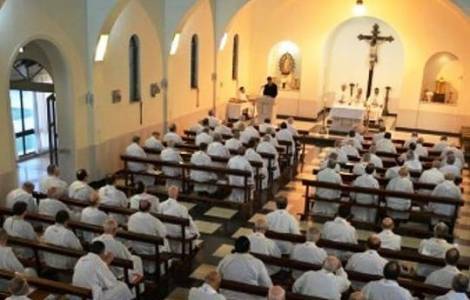 According to the statement sent to Agenzia Fides, the 93 convoked bishops, plus the invited guests (43 emeritus), will have to discuss in particular the situation of the country, which has undergone major changes in the last year. As pointed out by the President of CEA, Mgr. Oscar V. Ojea, Bishop of San Isidro, during the opening Mass celebrated last night at 7.30 pm, it has been "an extremely difficult year". Many events over the last few months represent great pastoral challenges that must be illuminated by the light of the Gospel". The President of the CEA listed some "complex and conflicting situations": the debate on abortion and its impact on many of our young people, including schools and communities; the phenomenon of apostasy; abuse; attacks against the Holy Father from within and outside the Church, "in an unprecedented manner". Mgr. Ojea then went on to say: "All of this is experienced in the context of a social and economic crisis affecting the entire Argentine people, which resulted from mistrust in political leadership, increasing social tension, anger and intolerance, that make coexistence very difficult". The President of the Episcopal Conference therefore suggests a serious reflection, as a Christian who listens to the Word of Jesus.